For those who know me in real life, or even virtually, know that I love me a good juicy hamburger. Probably about as much as I love BBQ! In fact, I’m making my way through several burger lists now so you know I’ve had my share. But one burger I’ve never had is a Big Mac. Nope. Never had it. Growing up my mom would make us homemade burgers all the time, along with home fries. I loved it when I came around the corner and saw those burgers and fries cooking. I would wait around to snag a fry as soon as they came off the stove top. We hardly ever had take out burgers when we would eat out. Eating out for my family was usually a steak dinner or pizza on Friday nights. As I became an adult, my quest for greasy burgers like mommas (or Aunt Lola’s) became the norm. Whenever I stay in a hotel, I usually order a burger from room service because some of those burgers are dee–licious! You know I’m right. When I saw this casserole for a Big Mac Attack making the rounds on social media, I knew I had to give it a try. Especially now that I’m keeping track of Weight Watchers points again. Depending on the ingredients you use, this can be very points friendly. Now I can’t compare the true thing to this casserole but I do know that this casserole was so good. I wanted to eat the entire dish. I’m pretty proud of myself that I only ate 1 serving. Ok so I combined the servings to make three instead of four. But I had the points! So, go ahead and give this a try. In a medium sauté pan, heat olive oil over medium heat. Add ground beef. Season with salt, pepper, garlic powder and onion powder. Add onions while beef is halfway to being completely browned. Mix together. Once beef is browned, drain. In a loaf pan, like this 1.5-Quart Loaf Pan, add beef. Top with dill pickles. Layer cheese slices on top. Place rolled out crescent rolls on top. Pinch seams together. Sprinkle sesame seeds over crescent rolls. 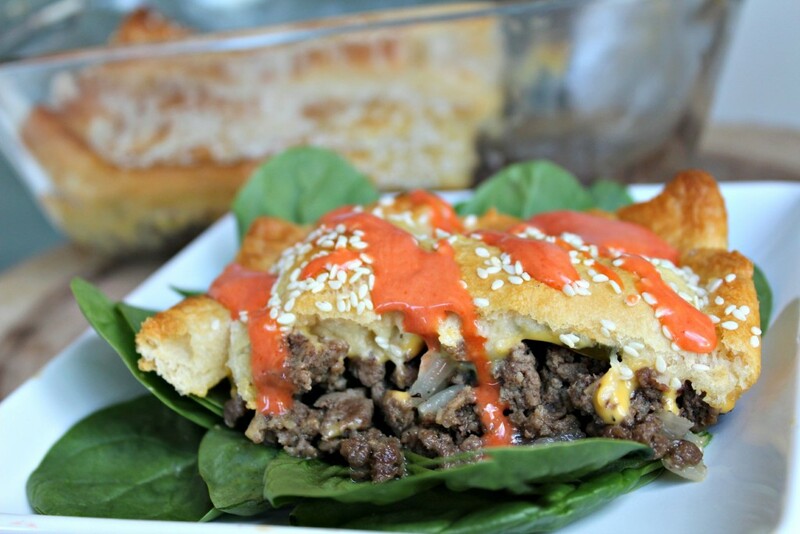 Place pan in oven and bake for 15-20 minutes, or until crescent rolls are cooked through. Mix together dressings and drizzle over casserole when ready to serve. Serve over lettuce. 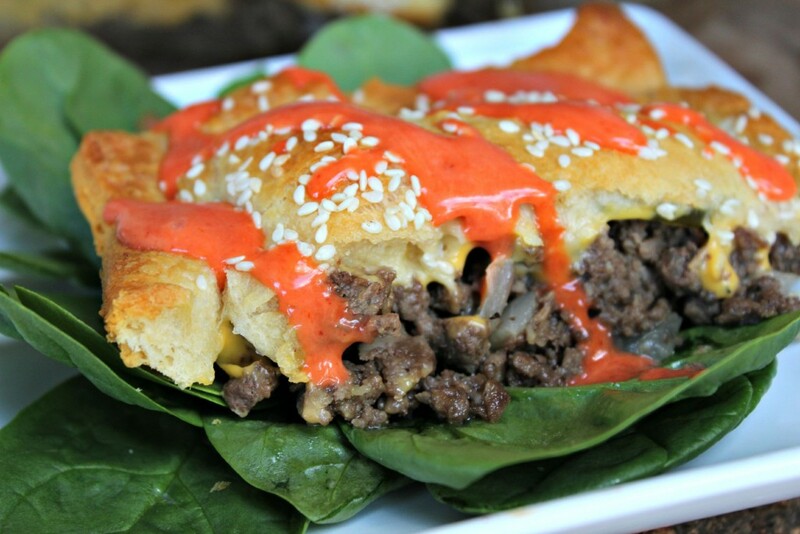 ** The points will vary on the type of beef you use, cheese slices and whether your crescent rolls are reduced fat or not. 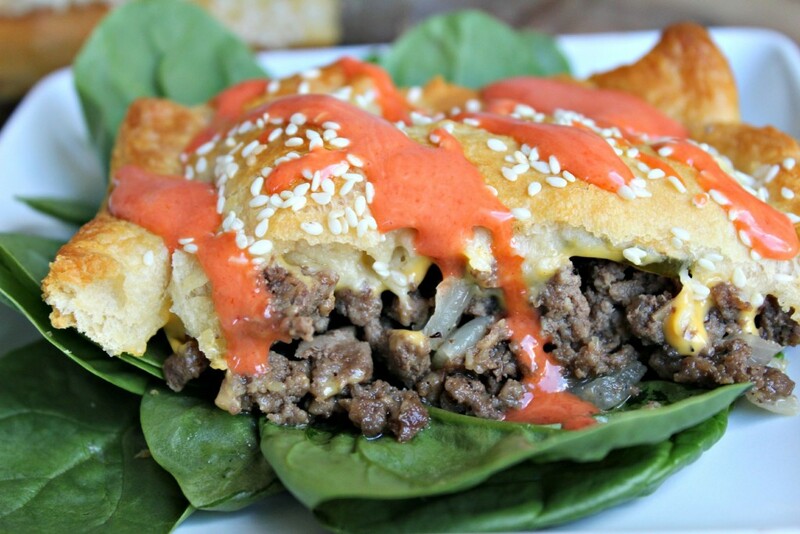 I used what I had on hand and made this into three servings with 80% lean beef, regular crescents and regular dressings = 11+ points per serving. ** Affiliate link is included for the loaf pan so I could show you what I used.